Prior to visiting Rio de Janeiro, I was told by numerous people to visit the famous Pão de Açúcar (Sugarloaf Mountain). “You must visit,” they said.”It has the best views in Rio de Janeiro,” they said. “You must visit,” they said. “It has the best views in Rio de Janeiro,” they said. I must admit that while I was looking out at the city from atop Sugarloaf Mountain and being in awe of the city’s beauty, I felt that the views paled in comparison to those seen from the top of the lesser-known Dois Irmãos mountain. If you have ever seen a picture from the beaches of Rio de Janeiro with the two mountains in the background, you have seen Dois Irmãos. It is the famous backdrop of many pictures that people take when they visit the city, however not many people actually take the trek up to the top of the mountains and they simply just admire it from a distance on Leblon or Ipanema beaches. As aforementioned, I feel as if the views on top of Dois Irmãos was better than those that I saw on top of Sugarloaf Mountain. On the hike up to the taller of the mountains, you have stunning views of São Conrado, a wealthy neighborhood in Rio; Rocinha, the largest favela in Brazil, and a partial view of Vidigal, a place I called my home during my one week stay in Rio. Once you ascend to the top of the highest mountain, the view will literally take your breath away. From the top, you have an amazing view of Leblon, Ipanema, Copacabana, Lagoa, Christ the Redeemer (in the distance), the Atlantic Ocean, and Guanabara Bay. Pictures simply cannot do this view justice, it is something that must be seen in person. There are both pros and cons when comparing Dois Irmãos vs. Pão de Açúcar. [pronounced: ‘Doy-sh Ear-mow-oos’], and they will point you in the direction. There are currently two directions that they will point you in, one being through the soccer field, and the other being up a random wall behind a row of houses (although locals have been getting annoyed with people climbing that wall, so you most likely will be directed to the former). Once you have either passed through the soccer field or climbed the wall you will come upon a trail, and that trail will lead you straight to the top of the higher mountain. When climbing the mountain, you should not only bring a good pair of shoes with grip (flip flops, sandals, and running sneakers will make your climb very difficult), but you should also bring at least two bottles of water with you. The climb up is very steep in some parts and there is a great chance that you will do a little bit of sliding, so be prepared to get your clothes a little dirty. Do not climb in the rain, as it will be very dangerous. 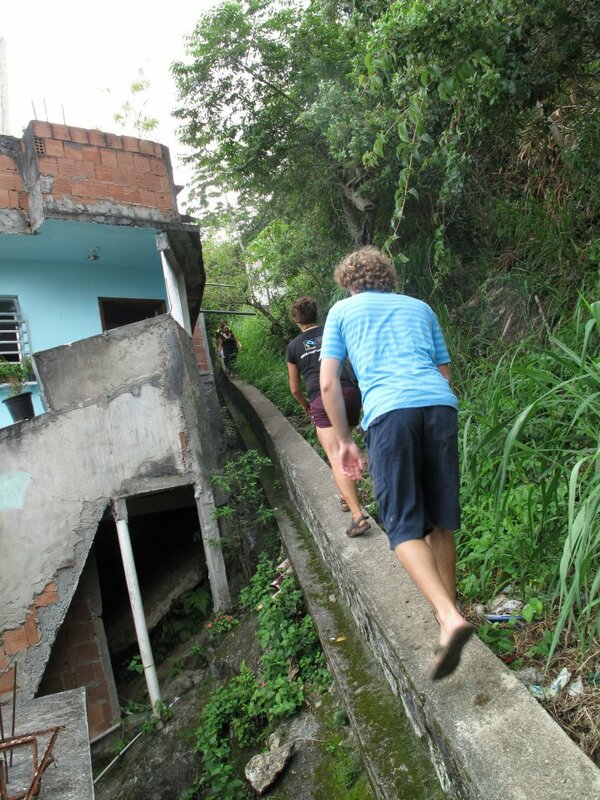 The entire hike from the top of Vidigal can take anywhere between 45 and 90 minutes. Some people take a tour guide up, but the hike is easily manageable without one; however, if you feel more comfortable with one, you can find information in the ‘Further Reading’ section. I did not take a tour guide to the top, so I cannot vouch for any of the companies, they are listed based on TripAdvisor reviews, so please research each company/individual for yourself]. That looks amazing!! I think Rio is one of the most stunning cities in the world. Unfortunately, I did not make it to the top of Dois Irmãos. Something I regret after seeing this! Hi Raphael, Sugarloaf and Corcovado combined ate up a lot of my travel budget. Dois Irmaos is great because it is free!